Product prices and availability are accurate as of 2019-04-20 18:01:51 UTC and are subject to change. Any price and availability information displayed on http://www.amazon.com/ at the time of purchase will apply to the purchase of this product. 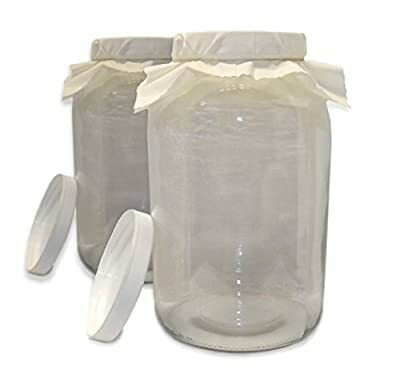 Our Kombucha Home Brewer's Pack comes with (2) One Gallon Glass Kombucha Jars, (2) cotton cloths; one for each jar to cover during fermentation, (2) rubber bands for wrapping the cloths, and (2) plastic lids for your jars for when you want to conveniently store your kombucha! Our Pack Is Great For Beginners and Experienced Brewers! INCLUDES TWO HIGH QUALITY 1 gallon kombucha jars, perfect for brewing delicious batches of your favorite recipe! BREATHABLE COTTON CLOTHS provide sufficient airflow for your kombucha. Effectively keep tiny critters and dust out of your tea while it ferments. Each cloth comes with a rubber band to secure the cloth around the jar. Plastic lids are also included for when you have finished brewing. GREAT VALUE KOMBUCHA PACK whether you are just beginning to brew or already have experience in brewing. You can enjoy two jars for experimenting with multiple recipes or double down on your favorite one. USING GLASS CONTAINERS for brewing kombucha is considered the best option for brewing because it doesn't contain harmful chemicals like BPA, and it not affected by the acidity of the brew while fermenting. OUR JARS ARE MADE IN THE USA!